Kenyon Fraser has worked with NHS Trusts from across Merseyside on a new health campaign designed to encourage frontline NHS health workers to have the seasonal flu vaccine this winter. The campaign, entitled #JabDone, was developed in collaboration between eight different NHS Trusts, Liverpool City Council and Liverpool CCG. 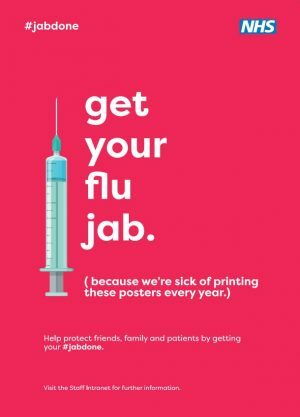 The campaign uses "gentle sarcasm and humour" to help challenge common staff excuses for not having the flu vaccine and encourages them to just get their #jabdone. A free seasonal flu vaccination is offered to all frontline NHS employees each year, to help them to protect themselves, their colleagues, patients and the wider local community from the latest strains of the flu virus. Over the coming weeks, the campaign will be appearing in staff areas at local hospitals, health centres and NHS buildings across the region. The campaign was officially launched with a series of ‘Mass Vaccination’ drop-in sessions for frontline health workers to attend in their workplace. Staff are also being invited to spread the message digitally amongst colleagues and patients, by posting a ‘flu selfie’ after they have been immunised and sharing it on social media using the hashtag #JabDone. The #JabDone campaign was based on staff insight and testing with staff from a number of participating Trusts, and will be evaluated in early 2017.